Suman Royal Resort is a deluxe boutique hotel in Kausani, serves its guests with modern amenities, comfort and warm hospitality. Every room of Suman Royal resort offers magnificent views of the verdant valley and Himalayan range. 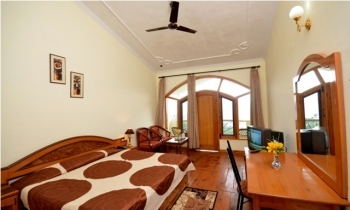 It is one of the most favored hotels in Kausani. Suman Royal Resort in Kausani is the ideal retreat for the nature enthusiasts, as the resort is surrounded by thick groves of deodar trees. Suman Hotels & Resorts is a prominent group of hotels in Kumaon region of Uttarakhand. The hotels of these groups are: Suman Paradise in Nainital, Corbett Suman Grand in Jim Corbett, Suman Royal Resort in Kausani and Hotel Sagar in Kausani. Suman Royal Resort is located at a distance of 1 Km from the Kausani bus stand and market, at the Snow View point. Some nearby tourist places near resort are Baijanth (17 kms), Kanda (63 kms), Someshwar (10 kms), Jageshwar (82 kms) and Bageshwar (40 kms). Suman Royal Resort serves a total of 27 spacious rooms categorized under Luxury (9), Premium (9) and Superior (9) rooms. The hotel offers gracious hospitality, modern comfort and elegance and enchanting view of the snow laden mountains and verdant valleys. The room facilities include satellite television, STD/ISD, private balcony and room service. En suite washrooms have round the clock running hot water. Bath amenities include moisturiser, soap and shampoo. The Suman Royal Hotel serves a multi cuisine restaurant named as Kanak Gold - Gourmet Delights. Kumauni cuisine can also be made on request. The restaurant serves sumptuous Indian, Chinese, Mughlai and Continental cuisines. Kanak Gold can serve 60 persons at a time. - Welcome Drink on Arrival (Non Alcoholic). - Meals: Breakfast and Dinner. - Tea Coffee Maker in the Rooms. - Free entry to Discotheque and all indoor games. - Outdoor games including a mini golf course. - The Above rates can be reduced to 1 Night on all dates except Long Weekends. 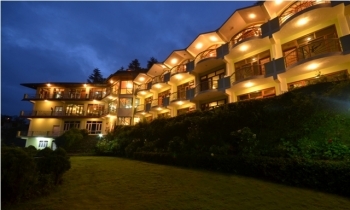 FOR Suman Royal Resort in Kausani, ONLY SEASONAL RATES WILL BE APPLICABLE ON LONG WEEKENDS. Booking : 100% Booking Amount against confirmed booking. Cancellation : A charge of 50% is levied on booking cancelled within 30 days of expected arrival of the Guest. 100% cancellation charges on no-show/ early check out or booking cancelled within 15 days of arrival of the guest at our Resort/Hotel. Kausani is well connected by motorable roads with major towns of Uttarakhand state. Suman Royal Resort in Kausani is located 53 kms from Almora, 79 kms from Ranikhet, 120 kms from Nainital, 148 kms from Corbett and 410 kms from Delhi. The nearest airport to Kausani is Pantnagar situated at a distance of 178 kms. The nearest railhead is Kathgodam located 142 kms from Kausani. By Road: There are two routes to reach Kausani from Delhi and NCR Region.